Archeology is the study of human history and prehistory through the excavation of sites and the analysis of artifacts and other physical remains. In this issue, we start a series of such historical finds unearthed from Philippines past, items now declared National Cultural Treasures. 1. The Flying Elephant of Lena Shoal. Another National Cultural Treasure, this blue-and-white dish with flying elephant design is one of only two pieces ever recovered in the world. It was retrieved from the Lena Shoal wreck site in Palawan in 1997 through an underwater exploration project initiated by the Far Eastern Foundation for Nautical Archaeology (FEFNA) and the National Museum. Made during the Middle Ming Dynasty (ca. 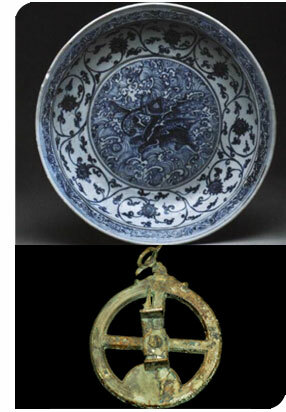 1500), the porcelain dish was recovered from the wreck site of a Chinese trading vessel. It features black and brown specks in the paste as well as lotus scroll with pointed leaves on the rim. On its center, you can clearly see a dark-blue flying elephant design made even more dramatic by a background of stormy and foamy waves. San Diego was a Spanish galleon that sank on December 14, 1600, claiming the lives of 259 people. In 1992, the shipwreck was discovered off Fortune Island in Nasugbu, Batangas. Among the artifacts recovered were cannons, anchors, guns, Mexican jars, and a rare navigational device called astrolabe. Estimated to be 400 years old, the San Diego's astrolabe – now a National Cultural Treasure – is one of only two existing astrolabes in the world.